Melodiya presents recordings of the prominent singer and soloist of the USSR Bolshoi Theatre Zurab Anjaparidze (1928-1997). �For eleven years of his career on the stage of the USSR Bolshoi Theatre he was � the best Herman, the best Radames, the best Jos�. Whatever the singer undertook, he created, and did it in a thorough, unhurriedly, with a sense of enormous responsibility and his own artistic dignity.� This is how the outstanding Irina Arkhipova described the performing art of Zurab Anjaparidze who was one her perennial partners at the Bolshoi Theatre. Thousands of spectators and listeners could not help but agree to her appraisal. 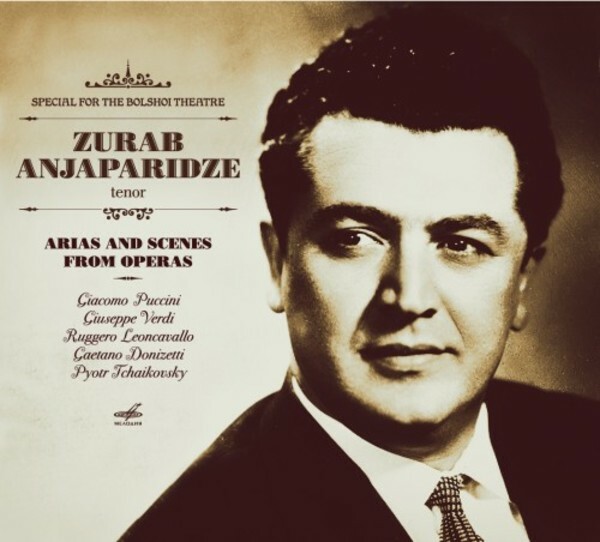 Anjaparidze�s voice preserved on tape still resonates with the beauty of its sound, wealth of its timbre with an inimitable Italian flavour, emotional fullness of every character he went through. Zurab Anjaparidze debuted at the Bolshoi as Don Jos� in Bizet�s Carmen in 1957. Along with the part of Radames in Verdi�s Aida, that role became Anjaparidze�s trademark, and soon the singer took the place of the leading heroic tenor of the opera company. The album includes fragments from the operas performed by Zurab Anjaparidze � The Queen of Spades, Aida, as well as Verdi�s Il Trovatore and Otello, Puccini�s Tosca and Manon Lescaut, Donizetti�s L�elisir d�amore and Leoncavallo�s Pagliacci. The recordings were made in the 1960s and 1970s with the orchestra of the USSR Bolshoi Theatre conducted by Boris Khaikin and Mark Ermler.